Squirrels are stubborn and they're among nature's greatest acrobats. 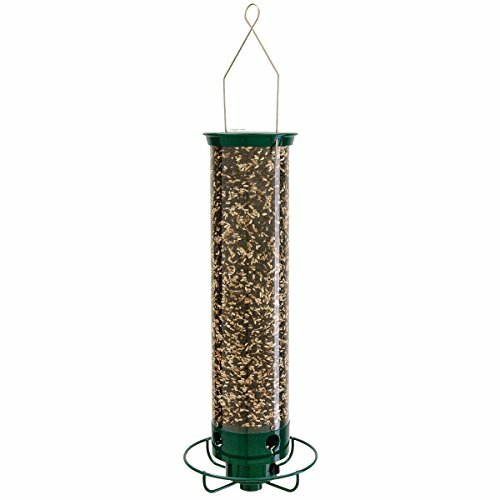 If you're looking for a top squirrel proof bird feeder, well, you're in the right place! ​Of the squirrel proof bird feeders we reviewed, our top pick goes to the Squirrel Buster. It does the job it's designed to do, keeps the squirrels out, lets the birds in, and protects the seed from the weather. ​It can be adjusted to be more or less sensitive to any given weight, so if you've got smaller squirrels in your area, you can adjust it to respond to their lighter weights and close. What is the Best Type of Squirrel Proof Feeders? ​Are There Squirrel Proof Bird Feeders that Actually Work? ​How do Squirrel Proff Bird Feeders Work? ​What is the Best Way to Use a Squirrel Proof Bird Feeder? ​How and How Often should you Maintain Squirrel Proof Bird Feeders? ​Are you short on time or just want a quick answer? ​We've got the list for you right here. Or, you can keep on reading to get all the in-depth details. 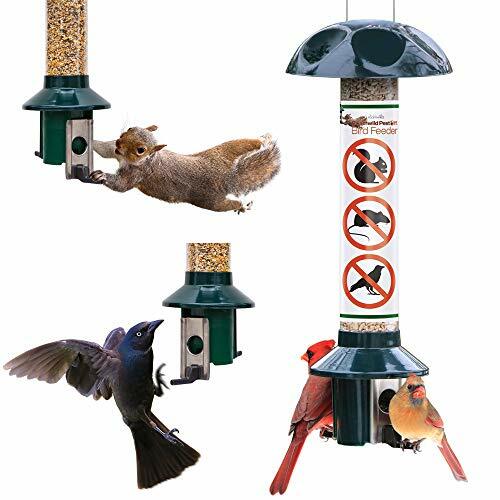 ​​Throughout the course of our reviews, we came to the conclusion that the best type of anti-squirrel or squirrel proof bird feeders, is the one which uses the squirrel's own weight against them. The cleverest squirrels in the world can't escape from their own weight, which makes it very hard for them to defeat a trap based on how much they weigh. Read Also: What're the best traps for squirrels? ​As a counter-point to the weight-based mechanism, the bird feeder also needs to have a tough, inner holder for the seed itself. Otherwise, the squirrels will eventually be able to chew their way through the device. Someday we'd like to see one with a glass or metal tube in the middle. ​The following video is a short demonstration on how these feeders can basically protect your bird seeds from those cute but annoying scavengers. Squirrel proof bird feeders that work do exist. There are a couple of caveats though. Without exception, every manufacturer uses plastic of some kind for the inside tube that holds the birdseed. Even the rectangular, metal Woodlink bird feeder has plastic windows in it. ​​Another red flag is that bird feeders have to be maintained to keep them in good condition to resist intrusions by squirrels. Frequent inspections are required to stay on top of chew damage inflicted by them. Otherwise, your “great” bird feeder suddenly won't be so great. This is the easiest part to describe but perhaps the hardest part to engineer correctly. Squirrels are innately heavier than birds, so it should be simple to design a system that will automatically close when the heavier mammal steps or climbs on it. In practice, it depends greatly on the materials used and how well they're machined. If you try to “save money” by getting a less expensive model, you may wind up costing yourself more in the long run because of having to replace feeders that have broken, froze, or been chewed through. Read Also: What're the best poison's to get rid of squirrels? Squirrels are good jumpers. Bird feeders that rely on baffles to prevent squirrels from reaching the seed, need to be at least 10-15 feet away from any trees, poles, or buildings the squirrels can jump from. This may not sound like much, but try pacing it off in your yard and you'll discover there aren't many places where you can put those kinds of bird feeders. This is why weight activated feeders were invented. Since they rely on the squirrel's own weight to close off the seed ports, it doesn't matter how close or how far away the trees, poles, and buildings are. ​Whether you hang your bird feeder from a tree or shepherd's pole or decide to mount it on top of a pole is an aesthetic decision more than anything. Most of these types of feeders can only be hung, but where is all up to you. It doesn't make any difference at all. These bird feeders need to be cleaned once every six months at a minimum. Empty out all the seed and follow any disassembly instructions that came with your device. Some models are designed with removable shrouds while others aren't. Check the manual for your particular model. Wash it off with soap and water. Make sure you reach all the cracks and crevices where seed and particulate matter can accumulate and provide a breeding ground for bacteria. Scrub it out if you can. Rinse away all the soap and dry it off. Let it hang dry overnight. ​Use a very light machine oil to lubricate the hinges, springs, and all the other moving parts. Wipe off any excess and reassemble the feeder. Fill it with fresh birdseed (don't reuse any old seed) and put the feeder back in place. As a recap, here are the 5 squirrel proof bird feeders we reviewed. Our #1 pick went to the Squirrel Buster, but you can check the others as well to see if one of them might better suit your individual needs. Specifically, the Droll Yankees Flipper might be right up your alley. Besides, it's just plain fun to watch the squirrels get flung off the feeder. ​Continue reading to get all the important details of each device. ​A shroud fits over the bottom of the feeder, with holes in it that align with the seed ports. This provides access to the seed for birds. 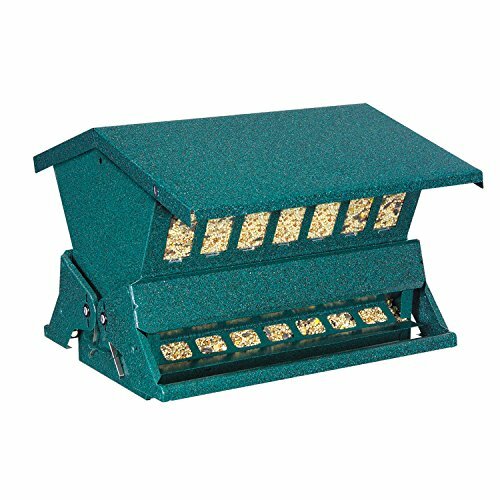 But when a squirrel with it's heavier weight climbs onto the feeder, the shroud automatically comes down, closing the seed ports and preventing the squirrel – and even heavier birds – from getting the seed. ​It's a no-win situation for the squirrel. He can't get to the seed without climbing on the feeder, and if he climbs on the feeder his own weight closes the seed ports off. ​The shroud can be adjusted to close from different amounts of weight, either up or down as necessary. If you want to increase the adjustment, turn the cartridge clockwise. This will increase the weight needed to close the seed ports. If you want to decrease the adjustment, turn the cartridge counter clockwise. This will decrease the weight needed to close the seed ports. ​The ports are well recessed and the entire device is designed with good ventilation for the seeds, keeping them dry. ​It's constructed from heavy-duty RoxResin, which is advertised as “chew-proof”. It's easy to fill and refill. Larger birds, such as Cardinals don't like using it, perhaps because the seed ports are so deep. ​This one is a lot of fun to watch. The bottom ring that the birds sit on has a battery powered motor in it that spins the ring around in circles when a squirrel, with their heavier weight, climbs up for a snack. The squirrels can't hold on for long around the circle then get flung off. You have to watch pretty close or you'll miss it But if you're able to catch one in action, the whole scenario is kinda funny. You can put a wide variety of seed in the feed tube, which is large and durable. It holds up to 5-pounds of bird seed. The base and cap are constructed from heavy metals and are covered with weather resistant paint. ​Because it is battery powered you have to recharge it occasionally. ​You must be keen in observing whether or not your bird feeder still has enough spinning power. Otherwise, your device becomes an open invitation for these acrobatic scavengers. ​This is a large capacity bird feeder, able to hold up to twelve pounds of mixed birdseed at a time. It is constructed from steel, with a durable powder coat on it to prevent rust. The two-sided design attracts a lot of birds. ​Like other squirrel proof bird feeders, the Woodlink relies on the squirrel's own weight to close off access to the seed. It works fairly well but we wish the top was a little higher in order to make it more difficult for large squirrels to hang down by their rears feet and get the seed. Some squirrels are able to figure out how to defeat it. ​There is an adjustable weight setting so you can select what size and weight of birds can feed there or not. Squirrels obviously are unwanted but some larger birds will bully the smaller once and the weight adjustment can be used to block the bullies from the seeds. ​It is ready to be hung or pole mounted as soon as you get it. The box includes the hardware for either choice. This is ready to use straight out of the box. Each port is individually spring loaded and weighted to close off one seed port at a time. Some weight sensitive shrouds close all the ports at the same time which can be a problem when multiple birds feed simultaneously. ​The individual springs never need adjustments. Just unbox it, fill it with birdseed, and hang it. You're done. 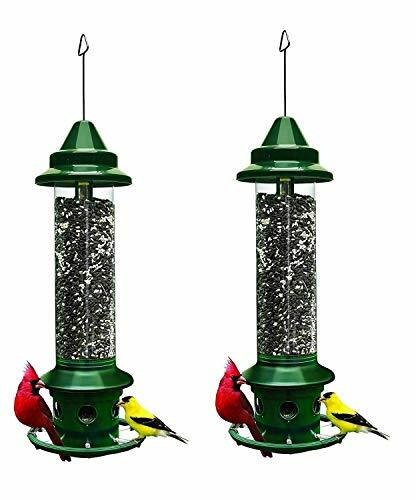 ​It has a 3-pound seed capacity, and the metal construction (except for the seed tube) is weatherproof with waterproof powder-coat covering the entire surface of the feeder. It helps keep the seed fresh and dry, along with the little rain cover. It's also easy to refill, just open the lid. You don't have to take the whole thing apart as some bird feeders require. ​The problem with “never need adjusting” springs is that eventually they wear out and lose their strength. Plus, some squirrels have been able to stand on one seed port cover and reach around to the open one on the other side and fish out the seed from it. ​It's simple and easy to use, but maybe it's a bit over-simplified. Furthermore, the plastic tubing is not chew-proof. Squirrels can, and have, chewed through it in short order. ​This bird feeder can be a nice aesthetic addition to your garden. It has an elegant tulip design that's nice on the eyes with tall construction to accommodate up to 6 pounds of birdseed. The seed compartment tube is transparent so that it will be easy to monitor as to whether or not you need to do a refill. It comes with a U-shaped perch that birds love and squirrels hate. It comes with a squirrel proof wire hanger and a sure-lock cap system to keep intruders away. Maintaining the feeder is quite simple and easy. Use soap and water to wash off dirt at least once every two weeks. There are lots of anti-squirrel bird feeders on the market, but in the end, there can be only one winner. Overall, our top choice goes to Squirrel Buster Plus. 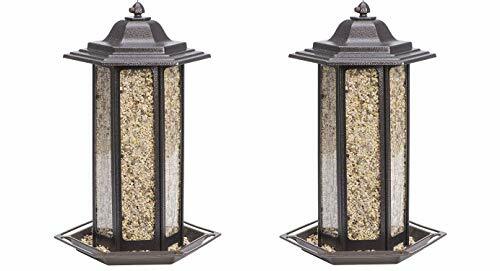 It's been reviewed, and re-reviewed many times over and consistently comes out on top as the most squirrel proof bird feeder available. A close, and amusing, second one though is the Droll Yankees Flipper. This battery powered bird feeder flings the squirrels away when they try to get the seed. Maintain your feeders in good condition and keep an eye on chew damage to get years of use out of them.